Info > Why Not Other Foams? Foams differ widely not only in the safety of their ingredients, but also in comfort, performance, and durability. 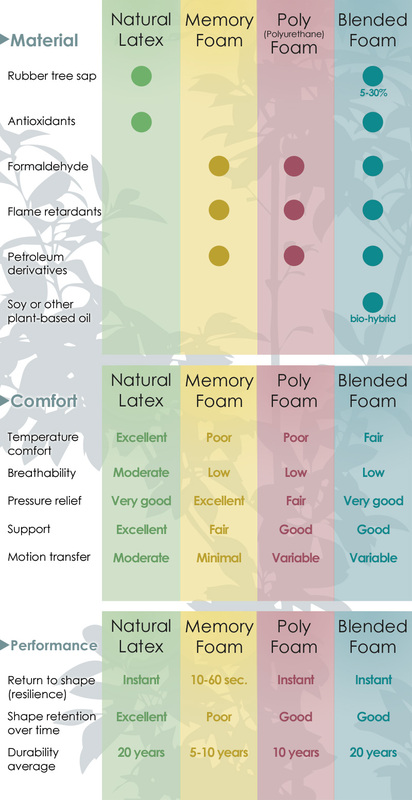 These charts compare the types of foams found in mattresses. Read summaries below the charts. Blended or “bio-hybrid” foams contain a small percentage of rubber or plant oils, but are primarily synthetic. Most synthetic foams and gels contain large amounts of poorly-regulated chemicals, particularly flame retardants, that pose significant health risks. Continuous exposure to off-gassing chemicals alters sleepers’ hormone levels, even after the chemical smell is gone. Endocrine-disrupting chemicals are known to increase risks for obesity, cancer, and infertility, and are suspected contributors to developmental brain disorders such as autism and ADHD. Savvy Rest’s natural latex foam is certified safe and healthful, without these toxic ingredients. Memory foam is initially comfortable, but infamous for trapping heat under a sleeper’s body. Some versions add additional "cooling chemicals" to counteract this problem. Memory foam's chemical reaction takes several minutes or more to develop fully and must be repeated to re-contour the surface with every position change. This can cause restless sleep overall. Other synthetic foams vary in comfort quality. 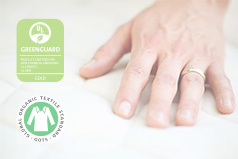 Natural latex is among the most luxurious and adaptable mattress materials. Layers can be very soft, very firm, or combined to create any comfort level in between. Savvy Rest offers hundreds of customized configurations. Natural latex foam promotes deeper, longer sleep, and its natural characteristics help relieve some pain conditions. Memory foam and other synthetic “foam rubbers” with minimal or no natural rubber content tend to lose their supportiveness, sometimes after just a few years. Natural latex is the most durable natural foam available, and natural latex mattresses often last two decades or longer. 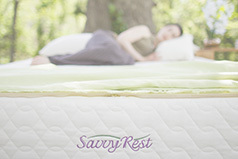 Savvy Rest has found that many people report having needed to replace one or more synthetic mattresses during the same period. Because natural latex is biodegradable, it can ultimately be recycled for use in new products, or even shredded for mulch.